Startups across 39 US states are applying artificial intelligence tech across industries like marketing, healthcare, retail, and more. Funding to artificial intelligence startups is soaring. Last year, VCs invested a record $9.3B into US AI startups — more than 8x funding levels just 5 years ago ($1.1B in 2013). In 2018, the top 3 states for AI deals were California (48% of deals), New York (12%), and Massachusetts (9%), though investors have bet on AI startups across the country. 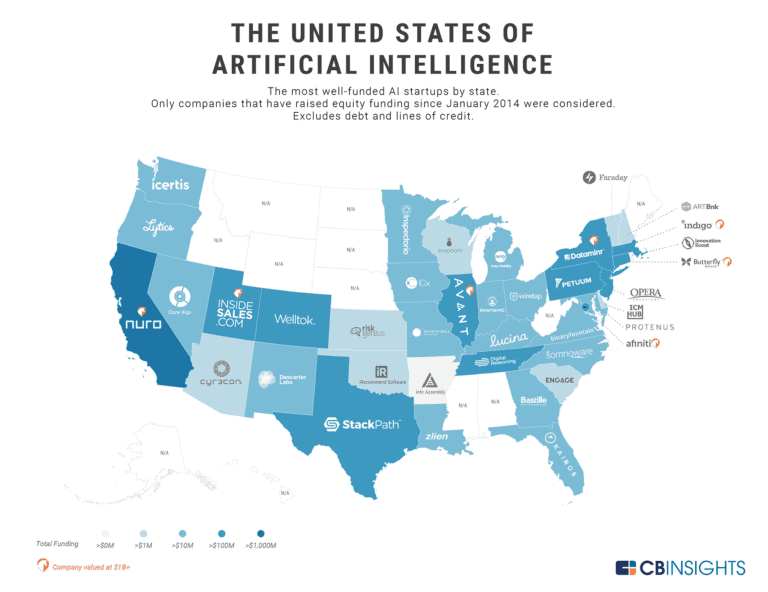 Using the CB Insights database, we mapped out the top-funded AI startup in every US state. Collectively, these startups have raised over $5B, with leading companies such as Butterfly Network (Connecticut, $350M in total disclosed equity funding), Welltok (Colorado, $339M), and InsideSales.com (Utah, $264M). Our analysis looked at equity funding to private, VC-backed AI startups that have had an equity deal in the last 5 years. We exclude funding from debt, loans, and lines of credit. The most well-funded US artificial intelligence startup is Nuro, with over $1B in disclosed equity funding (as of 03/13/2019), including a $940M Series B from SoftBank. The California-based startup is developing autonomous vehicles, with a focus on last-mile delivery. Nuro is followed by Illinois’ Avant ($655M) and Massachusetts’ Indigo Agriculture ($617M). There are 7 unicorn startups on our map: agtech startup Indigo Agriculture ($3.5B valuation), Nuro ($2.7B), alternative lending startup Avant ($1.9B), AI-powered predictive sales acceleration platform InsideSales.com ($1.7B), salestech startup Afiniti ($1.6B), healthcare startup Butterfly Network ($1.3B), and data analytics company Dataminr ($1.2B). 12 startups on the map have raised over $100M in disclosed equity funding. They include cybersecurity company StackPath ($180M) and fintech companies Opera Solutions ($122M) & Petuum ($108M). 29 startups on this list have raised <$10M in equity funding. The startup with the least funding on the list is Rhode Island’s The Innovation Scout, a SaaS platform that has raised $50K. This study was conducted by CBInsights and originially appeared here.